What? Sequences of multiple-choice questions that emphasize qualitative reasoning and multiple representations. For interactive discussion in large lecture classes with clickers or flashcards. Accompanied by lecture notes, exams, and free-response worksheets. Designed for students with less preparation. Why? Similar to Peer Instruction, but includes a higher proportion of interactive activities, and a full set of materials for an intro E&M course. The conceptual "step-size" from one question to the next is relatively small, offering a more gentle approach for students with limited preparation. Why not? Materials are only available for the second semester of intro physics. This is a band-aid on a traditional lecture course structure, which is less ideal than making a more drastic change to your course structure and engaging students in working on longer and more meaningful problems. Mini-lecture: Brief introduction/review of the basic concepts (3–7 minutes). Interactive questions: A sequence of multiple-choice questions posed to the class. These emphasize qualitative reasoning, proceeding from relatively simple to more challenging, and are closely linked to each other to explore one or two concepts from a multitude of perspectives, using a variety of representations. Students provide responses by using the flash cards. Brief free-response exercises, for example, drawing simple diagrams or performing elementary calculations, are interspersed. Follow-up activities: Interactive demonstrations, group work using free-response worksheets, or another mini-lecture and question sequence. From D. Meltzer and K. Manivannan, Transforming the lecture-hall environment: The fully interactive physics lecture, Am. J. Phys. 70 (6), 639 (2002). Intro Article: D. Meltzer and K. Manivannan, Transforming the lecture-hall environment: The fully interactive physics lecture, Am. J. Phys. 70 (6), 639 (2002). You can download a full set of materials for an introductory E&M course, including sequences of multiple-choice questions that emphasize qualitative reasoning and multiple representations, lecture notes, exams, and free-response worksheets, for free from the developer's website. 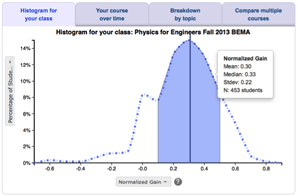 The developers do not provide materials for introductory mechanics because they rely more heavily on other published materials, such as Knight's Student Workbook for Physics and the Tutorials in Introductory Physics. You can download a sample series fo questions from PhysPort.